KaBOOM! 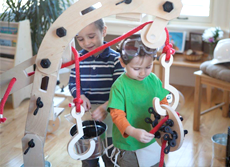 Encourages Inquisitive Minds, Creative Spirits with Rigamajig | KaBOOM! A bucket, a wagon, a spaceship and a robot monster made out of the same toy? KaBOOM! introduces Rigamajig, a large-scale, hands-on building kit that motivates children to create, develop and learn through play. With a set of wooden planks, wheels, pulleys, nuts, bolts and rope, children can follow their curiosity and build contraptions to suit their imagination. Feats of creativity are accomplished as kids work together to share resources, make friends and develop gadgets, gizmos and more! Based on the European model of adventure playgrounds, Rigamajig was conceived and designed by Heroes Will Rise founder Cas Holman to encourage cooperative, imaginative and constructive play. KaBOOM!, the national non-profit advocating for the healthy balance of play, is bringing Rigamajig to classrooms, playgrounds and communities throughout the United States. What exactly can be made? With Rigamajig, there are no right or wrong answers. The intuitive design allows children to collaborate, tinker, invent and imagine, all while participating in the process of trial and error to make their creations come to life. Once their hands, bodies and minds are moving, children create not only life-size contraptions, but elaborate stories to go along with them. 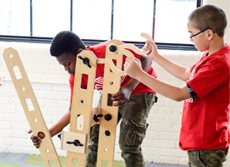 "Rigamajig isn't just a product, but a platform from which to learn and practice playful learning, hands-on building, creative problem solving, and spatial thinking," Holman says. "Kids run and reach and hold and scoot without even noticing. It's about the soft and hard skills that are learned while kids are engaged in play." 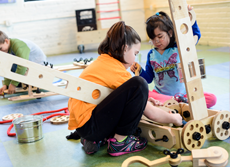 Guidance can be given by educators and supervisors with the help of active play prompts, challenging children to build contraptions that can lift things, incorporate various other materials, or even take them to the center of the earth. As children continue to use Rigamajig, essential skills rooted in STEAM (Science, Technology, Engineering, Art, Math) learning, art and social studies are fostered. "Rigamajig is an outstanding example of the crucial active play children need to become healthy successful adults," says KaBOOM! President Bruce Bowman. "The product cultivates active minds, active bodies and active relationships, the key pillars KaBOOM! believes kids require as they continue to learn and grow." Made in the United States with over 250 kid-friendly parts, Rigamajig is also earth friendly. The wooden pieces are made with the highest grade Baltic Birch Plywood and the plastic pieces are made with 100 percent recycled nylon, all crafted to last generations. Interviews with Cas Holman are available. For more information on Rigamajig, or to purchase a kit, please visit kaboom.org/rigamajig.